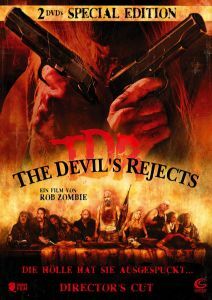 Informationen OT:The Devil’s Rejects ca.106 Minuten USA 2005 Regie Rob Zombie Darsteller Sid Haig Bill Moseley Sheri Moon Ken Foree u.a. Informationen OT:Devil’s Diary ca. 90 Minuten Kanada 2007 Regie Farhad Mann Darsteller Alexz Johnson Miriam McDonald Deanna Casaluce Magda Apanowicz u.a.